How you can get active! There are many ways to get active! The Physical Activity Guidelines for Adults (ages 18-64) recommend the amount and kinds of activities to aim for. For maximum health benefits, it is recommended that adults aged 18-64 should accumulate at least 150 minutes of moderate- to vigorous-intensity physical activity per week, in bouts of 10 minutes or more. More is even better. Moderate-intensity activities will make you sweat a little and breathe harder. Examples include: brisk walking and bike riding. Vigorous-intensity activities will make you sweat and feel ‘out of breath’. 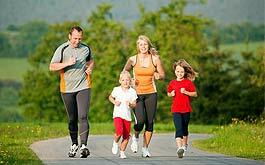 Examples include: jogging, swimming and cross-country skiing. Strength building of activities cause the muscles to contract against resistance and pull on bone, which helps to build strong muscles and bones. This form of activity should be performed at least 2 days a week. Examples include: swimming, activities that use body weight such as yoga, rowing, and strength training. Interested in getting active? Try some of these activities! Some adults enjoy running marathons, while others find a 15 minute walk a challenge. Everyone has a different level of fitness, so participate in what YOU feel comfortable in and enjoy doing! Here are some ideas to get you started…. Interested in learning more about the physical activity guidelines for adults? Find out more with this Canadian Physical Activity Guideline PDF.